The main auditorium of the Royal Opera House. 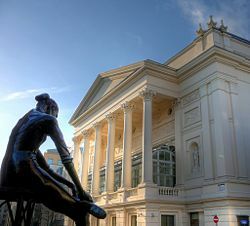 The Royal Opera House, the United Kingdom's most important performing arts venue, is located in London's Covent Garden district. The large building, which has been rebuilt twice, and is often referred to as simply "Covent Garden," is the home of The Royal Opera, The Royal Ballet, and the Orchestra of the Royal Opera House. The history of the Royal Opera House has roots that reach back nearly three hundred years, to 1728, and for quite some time, was one of only two theaters in London that were licensed in presenting the spoken word in the city. What began as primarily a center for drama and plays has, over time, progressed into one of the foremost opera houses in the world. The Royal Opera House has proven its value to London society through a long history of popular performances, destructive fires and redevelopment. As a performing arts venue, the hall serves an important role in providing the area with the chance to experience the beauty of the arts, with the ability to enrich and renew people's lives and expand their horizons. The exterior of the Royal Opera House. The Convent Garden flower market, featured prominently in the photograph, was incorporated into the Opera House during the renovations of the 1990s. 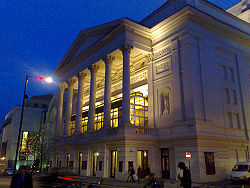 The current Royal Opera House is the third theater built on the Covent Garden site. Its history begins with John Rich, an actor and manager at Lincoln's Inn Fields, in 1728. The original theater was opened in 1732. It was destroyed by fire several times, and rebuilt. From 1946, when it reopened as a performance venue after a short stint as a dance hall during World War II, it became the United Kingdom's first permanent home for opera and ballet. In the nearly three centuries of its history, the Royal Opera House has become one of the most modern and sophisticated—and revered—Opera houses on the European continent. The facade, foyer and auditorium date from 1858, but almost every other element of the present complex dates from an extensive reconstruction in the 1990s. The Royal Opera House seats 2,268 people, with about 550 on the orchestra level, and four tiers of boxes and balconies including the amphitheater gallery on the top level. With a proscenium 12.20 m wide and 14.80 m high, the venue is home to the Royal Opera (previously known as the Convent Garden Opera Company) and Royal Ballet (previously known as Sadler's Wells Ballet). The modern Royal Opera House also boasts two additional performance spaces. A mid-scale public theater, the 400-seat Linbury Studio Theatre is perfect for chamber opera, experimental dance, or education activities. The Clore Studio Upstairs is a Royal Ballet studio that can hold an audience of more than 180, for intimate events and performances, in a laboratory-style experimental setting. 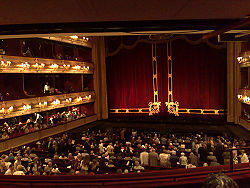 The Royal Opera was established in London, in 1945, under the name of Convent Garden Company Opera. In 1968, the Queen granted the right to rename the company the Royal Opera, in recognition of the quality of performance the young company had attained in its first decades. Works of the opera are generally performed in their original language, with international soloists. Past music directors include Karl Rankl (1945-51), Rafael Kubelík, George Solti, Colin Davis, and Bernard Haitink (1987-2002). From 2002, Antonio Pappano took the post of music director, with Elaine Padmore as Opera Director. 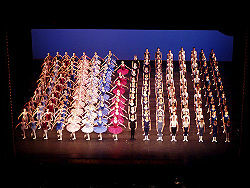 The Royal Ballet was established in 1931, by Ninette de Valouis and Lilian Baylis, under the name Vic-Wells Ballet. In the 1940s, after its move to Convent Garden, the name was changed to the Sadler's Wells Ballet. In 1956, the company received a royal charter and was renamed the Royal Ballet. Choreographers such as Frederick Ashton and dancers such as Rudolf Nureyev have been associated with the company, whose members have also included Alicia Markova, Margot Fonteyn, and Robert Helpmann. The Orchestra of the Royal Opera House was founded as the Convent Garden Orchestra when the theater reopened in 1946 after World War II. Through the years, the ranks of the orchestra have included a number of top musicians, and it has been acclaimed by critics and audiences alike. The Orchestra has also won many awards, including the 1995 and 1998 Evening Standard Opera Award for Outstanding Artistic Achievement, and the 1999 Laurence Olivier Award for Outstanding Achievement in Opera. In addition to performing for performances of the Royal Opera and the Royal Ballet, the Orchestra also performs on its own. Both the Orchestra and the Soloists play an active role in the education work of the Royal Opera House. The foundation of the Theatre Royal, Covent Garden lies in the letters patent awarded by Charles II to Sir William Davenant in 1660, allowing Davenant to operate one of only two patent theater companies in London, along with the Theatre Royal, Drury Lane. The letters gave these two theaters the exclusive rights to present spoken drama in London. During the first hundred years of Covent Garden's history, the theater was primarily a playhouse. Despite the frequent exchanges of artists and scripts between the Covent Garden and Drury Lane companies, competition was intense, with the two theaters often presenting the same plays at the same time. The letters patent of the Covent Garden Theatre remained in the possession of the Opera House until shortly after the First World War, when the document was sold to an American university library. A picture of the first theater drawn shortly before it burned down in 1808. In 1728, John Rich, actor-manager of the Duke's Company at Lincoln's Inn Fields Theatre, commissioned The Beggar's Opera from John Gay. The success of this venture provided him with the capital to build the Theatre Royal (designed by Edward Shepherd) at the site of an ancient convent garden, part of which had been developed by Inigo Jones in the 1630s, with a piazza and church. At its opening on December 7, 1732, Rich was carried by his actors in processional triumph into the theater for its opening production of William Congreve's The Way of the World. Rich introduced pantomime to the repertoire, himself performing (under the stage name John Lun, as Harlequin). In 1734, Covent Garden presented its first ballet, Pygmalion. Marie Sallé discarded tradition and her corset and danced in diaphanous robes. George Frideric Handel was named musical director of the company, at Lincoln's Inn Fields, in 1719, but his first season of opera, at Covent Garden, was not presented until much later, in 1735. His first opera was Il pastor fido followed by Ariodante (1735), the première of Alcina, and Atalanta the following year. There was a royal performance of the Messiah in 1743, which was a success and began a tradition of Lenten oratorio performances. From 1735 until his death in 1759, he gave regular seasons there, and many of his operas and oratorios were written for Covent Garden or had their first London performances there. He bequeathed his organ to John Rich, and it was placed in a prominent position on the stage, but was among many valuable items lost in the fire that destroyed the theater in 1808. In 1775, Richard Brinsley Sheridan's The Duenna premièred at Covent Garden. The auditorium of the second theater shortly after opening. 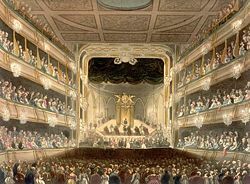 Rebuilding after the 1808 fire began in December of the same year, and the second Theatre Royal, Covent Garden (designed by Robert Smirke) opened about a year later, on September 18, 1809, with a performance of Macbeth followed by a musical entertainment called The Quaker. The actor-manager John Philip Kemble, raised seat prices to help recoup the cost of rebuilding, but the move was so unpopular that audiences disrupted performances by beating sticks, hissing, booing, and dancing. The Old Price Riots lasted over two months, and the management was finally forced to accede to the audience's demands. During this time, entertainments were varied; opera and ballet were presented, but not exclusively. Kemble engaged a variety of acts, including the child performer Master Betty. Many famous actors of the day appeared at the theater, including the tragedienne Sarah Siddons, the Shakespearean actors William Charles Macready, Edmund Kean and his son Charles. On March 25, 1833, Edmund Kean collapsed on stage while playing Othello, and died two months later. 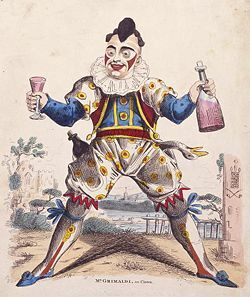 In 1806, the pantomime clown Joseph Grimaldi (The Garrick of Clowns) had performed his greatest success in Harlequin and Mother Goose; or the Golden Egg at Covent Garden, and this was subsequently revived, at the new theater. Grimaldi was an innovator: His performance as Joey introduced the clown to the world, building on the existing role of Harlequin derived from the Commedia dell'arte. 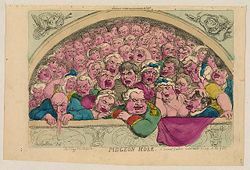 His father had been ballet-master at Drury Lane, and his physical comedy, his ability to invent visual tricks and buffoonery, and his ability to poke fun at the audience were extraordinary. Early pantomimes were performed as mimes accompanied by music, but as Music hall became popular, Grimaldi introduced the pantomime dame to the theater and was responsible for the tradition of audience singing. By 1821, dance and clowning had taken such a physical toll on Grimaldi that he could barely walk, and he retired from the theatre. By 1828, he was penniless, and Covent Garden held a benefit concert for him. In 1817, bare flame gaslight had replaced the former candles and oil lamps that lighted the Covent Garden stage. This was an improvement, but in 1837, Macready went a step further, employing limelight in the theater for the first time, during a performance of the pantomime, Peeping Tom of Coventry. Limelight used a block of quicklime heated by an oxygen and hydrogen flame. This allowed the use of spotlights to highlight performers on the stage. The Theatres Act 1843 broke the patent theatres' monopoly of drama. 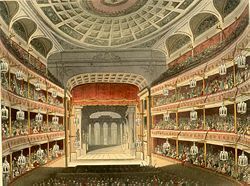 At that time, Her Majesty's Theatre in the Haymarket was the main center of ballet and opera but after a dispute with the management in 1846, Michael Costa, conductor at Her Majesty's, transferred his allegiance to Covent Garden, bringing most of the company with him. The auditorium was completely remodeled and the theater reopened as the Royal Italian Opera on April 6, 1847, with a performance of Rossini's Semiramide. In 1852, Louis Antoine Jullien, the eccentric French conductor and composer of light music, presented an opera of his own composition, Pietro il Grande. Five performances were given of the 'spectacular', including live horses on the stage and very loud music. Critics considered it a complete failure and Jullien was ruined and fled to America. The Royal Opera House at night. On March 5, 1856, the theater was again destroyed by fire. Work on the third theater, designed by Edward Middleton Barry, started in 1857, and the new building, which still remains as the nucleus of the present theater, opened on May 15, 1858, with a performance of Meyerbeer's Les Huguenots. 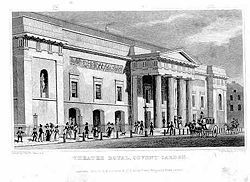 The Royal English Opera company under the management of Louisa Pyne and William Harrison, made their last performance at Theatre Royal, Drury Lane on December 11, 1858, and took up residence at the Covent Garden theater on December 20, 1858, with a performance of Michael Balfe's Satanella. The theater became the Royal Opera House (ROH) in 1892, and the number of French and German works in the repertory increased. Until 1864, the opera presented winter and summer seasons of opera and ballet, and the venue was also used for pantomime, recitals, and political meetings. During the First World War, the theater was requisitioned by the Ministry of Works for use as a furniture repository. From 1934 to 1936, Geoffrey Toye was Managing Director, working alongside the Artistic Director, Sir Thomas Beecham. Despite early successes, Toye and Beecham eventually had a falling out and Toye resigned. During the Second World War, the ROH became a dance hall. There was a possibility that it would remain so after the war but, following lengthy negotiations, the music publishers Boosey & Hawkes acquired the lease of the building. David Webster was appointed General Administrator, and Sadler's Wells Ballet was invited to become the resident ballet company. The newly created Covent Garden Opera Trust laid out plans "to establish Covent Garden as the national center of opera and ballet, employing British artists in all departments, wherever that is consistent with the maintenance of the best possible standards." The Royal Opera House reopened on February 20, 1946, with a performance of The Sleeping Beauty in an extravagant new production designed by Oliver Messel. Webster, with his music director Karl Rankl, immediately began to build a resident company. In December 1946, they shared their first production, Purcell's The Fairy-Queen, with the ballet company. On January 14, 1947, the Covent Garden Opera Company gave its first performance of Bizet's Carmen. Several renovations had taken place to parts of the house in the 1960s, including improvements to the amphitheater and an extension in the rear, but the theater clearly needed a major overhaul. In 1975 the Labour government gave land adjacent to the Royal Opera House for a long-overdue modernization, refurbishment and extension. By 1995, sufficient funds had been raised to enable the company to embark upon a major reconstruction of the building by Carillion, which took place between 1996 and 2000, under the chairmanship of Sir Angus Stirling. This involved the demolition of almost the whole site including several adjacent buildings to make room for a major increase in the size of the complex. The auditorium itself remained, but well over half of the complex is new. 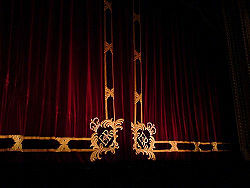 The Royal Curtains at the Royal Opera House. The design team was led by Jeremy Dixon and Ed Jones of Dixon Jones BDP as architects. The acoustic designers were Rob Harris and Jeremy Newton of Arup Acoustics. The building engineer was Arup. The new building has the same traditional horseshoe-shaped auditorium as before, but with greatly improved technical, rehearsal, office and educational facilities, a new studio theater called the Linbury Theatre, and much more public space. The inclusion of the adjacent old Floral Hall, long a part of the old Covent Garden Market but in general disrepair for many years, into the actual opera house created a new and extensive public gathering place. The venue now has a claim as the most modern theater facility in Europe. Surtitles, projected onto a screen above the proscenium, are used for all opera performances. Also, the electronic libretto system provides translations onto small video screens for some seats, and additional monitors and screens are to be introduced to other parts of the house. Not only does the Royal Opera House put on performances by the Royal Opera and Royal Ballet in the evening, but since 1999 has also, opened its doors to the public during the day. When once only ticket holders could enter the theater—and even then, just before a performance—now thousands of visitors from all over the world are allowed to tour the historic facility. Guests are able to enjoy lunch, a gift shop, and exhibitions. ↑ 1.0 1.1 Answers.com. Royal Opera House. Retrieved December 14, 2008. ↑ 2.0 2.1 Royal Opera House, History. Retrieved December 14, 2008. ↑ Royal Opera House Orchestra at IMG,  Retrieved December 14, 2008. ↑ John Rich as Harlequin. PeoplePlayUK. Retrieved December 14, 2008. ↑ North Eastern University, Early ballet history. Retrieved December 14, 2008. ↑ PeoplePlayUK. The Old Price Riots. Retrieved December 14, 2008. ↑ NNDB, Edmund Kean (1789–1833). Retrieved December 14, 2008. ↑ PeoplePlayUK, Early Pantomime. Retrieved December 14, 2008. ↑ [http://www.archive.org/details/MemoirsOfJosephGrimaldi Memoirs of Joseph Grimaldi. (1853) ].Internet Archive. Retrieved December 14, 2008. ↑ Martin Banham. The Cambridge Guide to Theatre. (Cambridge University Press, 1995, ISBN 0521434378). ↑ Encyclopedia Britannica, Louis Antoine Jullien. Retrieved December 14, 2008. ↑ Alan Jefferson. Sir Thomas Beecham: A Centenary Tribute. (London: Macdonald and Jane’s, 1979, ISBN 035404205x). ↑ Carillion, Royal Opera House case study. Retrieved December 14, 2008. Allen, Mary. A House divided: the diary of a chief executive of the Royal Opera House. London: Simon & Schuster, 1998, ISBN 9780684858654. Banham, Martin. The Cambridge Guide to Theatre. Cambridge University Press, 1995, ISBN 0521434378. Beauvert, Thierry, Jacques Moatti, and Florian Kleinefenn. Opera houses of the world. New York: Vendome Press, 1996, ISBN 9780865659773. Boursnell, Clive, and Colin Thubron. The Royal Opera House Covent Garden. London: Hamilton, 1984, ISBN 9780241111888. Donaldson, Frances. The Royal Opera House in the twentieth century. London: Weidenfeld and Nicolson, 1988, ISBN 9780297791782. Drogheda, Garrett Moore, Ken Davison, and Andrew Wheatcroft. The Covent Garden album: 250 years of theatre, opera, and ballet. London: Routledge & Kegan Paul, 1981, ISBN 9780710008800. Earl, John, and Michael Sell. The Theatres Trust guide to British theatres, 1750-1950. London: A.&C. Black, 2000, ISBN 9780713656886. Haltrecht, Montague. The quiet showman: Sir David Webster and the Royal Opera House. London: Collins, 1975, ISBN 9780002111638. Jefferson, Alan. Sir Thomas Beecham: A Centenary Tribute. London: Macdonald and Jane’s, 1979, ISBN 035404205x. Lebrecht, Norman. Covent Garden: the untold story : dispatches from the English culture war, 1945-2000. Boston: Northeastern University Press, 2001, ISBN 9781555534882. Mosse, Kate. The House: inside the Royal Opera House, Covent Garden. London: BBC Books, 1995, ISBN 9780563370888. Rosenthal, Harold D. Opera at Covent Garden: a short history. London: Gollancz, 1967, OCLC: 954921. Tooley, John. In house: Covent Garden, 50 years of opera and ballet. London: Faber and Faber, 1999, ISBN 9780571194155. History of "Royal Opera House"
This page was last modified on 20 July 2015, at 21:17.